The chest is one of the "showpiece" areas of the body...every guy wants a bigger chest and stronger bench press and ladies want a more sculpted look. These exercises will help you achieve that. This exercise is one of the best exercises for building mass in the chest. 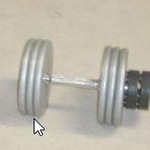 The dumbbells allow for greater freedom of movement and better pec activation than the barbell bench press. 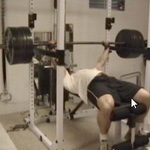 When people think chest training, they think bench press. It's a very effective chest-builder when done properly, however it's also one of the most misused exercises you'll see done in the gym. 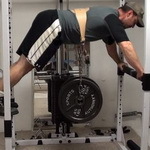 This version of the Incline Press is done using the power rack and starting from the bottom instead of going top-down. 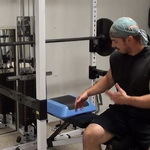 It's safer, easier on the shoulders and allows you to put your body in optimal pressing position on each rep. In addition to targeting the chest, this exercise will attack your core very strongly. You'll be taking support away from your upper back while pressing, forcing your abs to support your upper body and the weight. 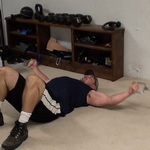 By positioning yourself on the floor for flyes, you take away a good deal of shoulder stress that you might normally get with the exercise while still retaining the ideal inwards resistance movement pattern for targeting the pecs. If you've ever wondered how to add resistance to the push-up, this one of the best ways I've found to do it. It will allow you to add as much weight as you can handle without needing a partner to help. This upper-chest bodyweight exercise is for advanced trainers only. You'll have bands pulling your hands out laterally while you activate the pecs to keep them in...as you're doing a push-up with your feet up on wall. This push-up variation works the upper body in a lateral movement pattern. On each rep, you're going to walk your arms and legs to the side. If you need a more challenging version of the push-up, this exercise will do it for you. Unlike standard one-arm push-ups (that hit the tricep more), this version hits the pecs extremely hard. This is one of the toughest push-up variations I've ever tried...definitely an advanced exercise. It puts massive workload on one side of the body while forcing the other side to support that horizontal body position by bracing hard. This single-dumbbell exercise targets the upper/inner aspect of the chest. 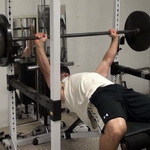 It's a close grip bench press for your upper pecs. At the bottom of every single rep, you're going to slightly shift your grip on the bar. This puts incredible tension onto the inner aspect of the pecs. Turn the dumbbell press into a cross-body movement, changing the angle of the exercise and putting direct tension on the inner chest area. Learn multiple variations of the unstable push-up, training your stabilizing muscles and your chest at the same time. 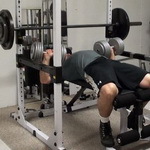 These powerful methods and form tweaks will help you add weight to your bench press very quickly...in some cases immediately! 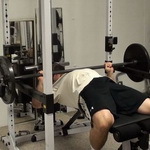 To properly set up the body for a big bench press, you need to use the strong muscles of your BACK to pull the shoulders into proper position. Learn how to do it here. 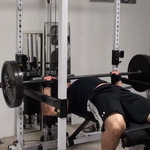 The bench press is a total-body movement...not just the chest and arms. 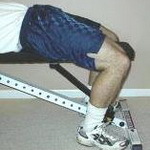 By driving with the legs at the exact right moment, you will be stronger out of the bottom of the press. Many people have a hard time feeling their pecs working when they set out to train their chest...these tips and techniques will help you engage the pecs so get maximum growth and strength stimulation from your training. The upper chest can be a tough area to hit. 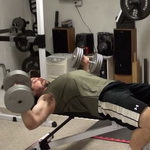 These 3 exercises laser-target the upper pecs with very specific body positions and movements. Slow static stretching will NOT help you be stronger on the bench. This power-oriented warm-up technique will activate the right muscles and fire up your nervous system for the heavy work to come. 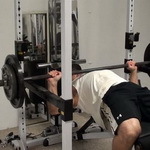 Learn how to keep your body from working AGAINST you on the bench press. It's only trying to protect itself, but it'll make you weaker! 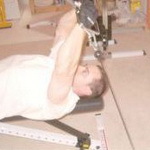 For maximum pec stimulation, you need to use exercises that work the stretch, mid-range and contracted position. This exercise hits all three of those in ONE movement using multiple resistances. This simple in-set superset will help you activate the pecs and get an excellent growth stimulus at the same time. Setting your feet on the wall for Incline Presses can help you be stronger immediately, by engaging the lower body more strongly in the movement. 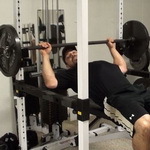 Expanding the chest and getting the shoulders back is critical to getting pec activation on the bench press. However, it can be tough to do when you're laying flat on a bench. This simple method helps teach your body proper positioning. Slightly uneven loading of the dumbbells you're using can help you put more tension on the target muscles by forcing them to activate to counterbalance that off-center load. Cover all three major muscle fiber types in this 3-part giant set. You keep the same weight, and same exercise...you just change the reps and the range of motion. This is a simple way to seriously ramp up the intensity of your chest training. You'll move from less stable exercises, that require more balance, to more stable exercises that take up some of the balance for you. 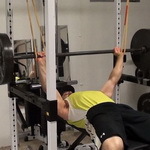 For a big bench press, you need to get your back in the proper position...this easy trick with a pair of bands will teach you exactly how to do it for maximum results. 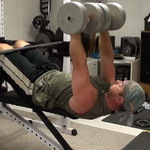 Chest training is fun...and these amazing, new exercises will make it even MORE fun...and MUCH more effective..